Multi-family home designs are a popular option for families of all sizes and can range from a two-unit duplex to a multi-family plan with over twelve individual dwellings. Multi-family houses can be a great source of income, energy efficient, and economical to build. Keep in mind to contact your local building codes department because often these house designs are zoned differently and approval may be necessary before construction can begin. The has 4 bedrooms, 2 full baths and 2 half baths. 3019 Sq. Ft., Width 128'-6", Depth 53'-0"
3341 Sq. Ft., Width 70'-0", Depth 41'-0"
The has 4 bedrooms and 4 full baths. 6968 Sq. Ft., Width 80'-0", Depth 62'-0"
3484 Sq. Ft., Width 120'-0", Depth 62'-0"
The Colbourne Springs Duplex has 6 bedrooms, 4 full baths and 2 half baths. 4128 Sq. Ft., Width 56'-0", Depth 54'-0"
The Colbourne Acres Multi-Family has 12 bedrooms, 8 full baths and 4 half baths. 8260 Sq. Ft., Width 111'-8", Depth 50'-0"
The Lynnae Country Duplex has 4 bedrooms, 4 full baths and 2 half baths. The Audrey Creek Craftsman Duplex has 6 bedrooms and 4 full baths. 6800 Sq. 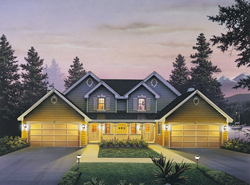 Ft., Width 50'-0", Depth 36'-0"
The Bandon Modern Duplex has 6 bedrooms and 4 full baths. 9568 Sq. Ft., Width 66'-0", Depth 42'-0"
The Bassett Path Rustic Fourplex has 12 bedrooms, 8 full baths and 4 half baths. 21832 Sq. Ft., Width 84'-0", Depth 27'-0"
See Multi-Family houses collection featuring functional floor plans perfect for multi-unit dwellings. With such a large selection, you are bound to find the perfect style. Find and build you dream home. Check out House Plans and More and see our selection of Multi-Family home plans that you are sure to love.